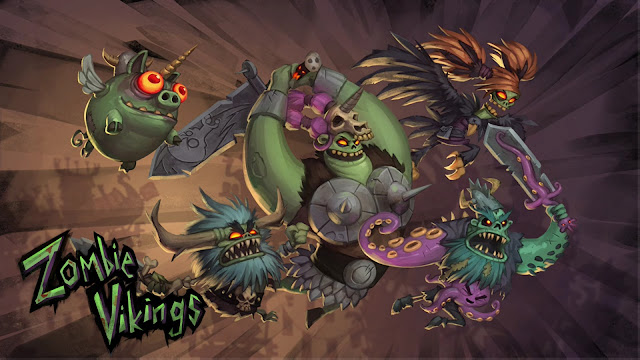 Zombie Vikings for me originally looked like one of those small releases that offered fun and a few laughs along the way, while at the same time offering the classic 2D, side-scrolling, button mashing experience a load of us grew up with. Having a unique look makes it stand out too, but other than those few things is Zombie Vikings worth your cash? Loading this up earlier in the week for a quick stream, initial thoughts were good, with the game having a decent opening to it filled with humour and a combat system that seemed to work really well. The story was also there to keep things ticking along, with a guy called Odin having his eye stolen by a guy called Loki, with Odin bringing back four zombie warriors to go and get it back for him. What follows is numerous levels in which you hack and slash your way through them, collecting coins for upgrades, and taking down all different types of enemies as the story unfolds. My main issue with Zombie Vikings came very early on in the game, with the game feeling very repetitive when it came to how the levels are laid out to you. The other thing was just the story, with my brain losing interest in it very early on, and the cut-scenes used slowly becoming less interesting the more I moved on. The humour used was refreshing to see from games I've been reviewing in recent weeks, but even that reached a point where the little smile appearing on my face early on just wasn't there anymore. The other thing was the game offering 4-player co-op, which let me think I could plan on sitting down with the kids and giving this a bash, but soon enough you could see that while the game is given a 12+ rating, it wasn't that suited to kids of a certain age. I can be a little bit too strict at times, so for you out there it might be different (I'm still the rubbish Dad who won't let the Son play GTA or COD and he is 13 this year). The B-bomb being dropped early on was to blame, but like I say it's purely down to personal choice. Overall: A fun little game, if not a tad repetitive if you plan on going it alone. The game can be played online (friends online) and offline with three other people, so pick it up with mates and this could kill a few nights.